The photo journal from the Gathering 24 is now available to view. All photos are available to download for personal use. Photos: Andy Labrow. Dr. Ian Clarke. Jeff Pitt. Stuart Ling. Lucas Labrow. It was The Gathering weekend that had it all. Congregated at Venue Cymru, Llandudno, North Wales, Alarm fans from all over the world expecting a trip down memory lane, were caught by surprise on the opening Friday night when Mike Peters strode purposefully onto the stage at 9.00 PM and delivered an opening set of brand new material that was of the highest order and potentially some of the best material the man has ever written. It was the scene setter for another incredible weekend of human drama that unfolded over a three day period. Watching Mike Peters on Friday night without a group, but playing as a one man band utilising both acoustic and electric instruments, a bass drum and even a few bars of piano is a sight to behold and when you understand that he is doing all of this while still undergoing chemotherapy treatment, makes for an awe-inspiring insight into the strength of the human spirit. For over two hours, he kept the audience spell-bound with his delivery of powerful, lyrically deep new songs and then a thoroughly modern recreation of a set list performed by The Alarm at a historic concert broadcast around the world via satellite from Los Angeles in 1986. 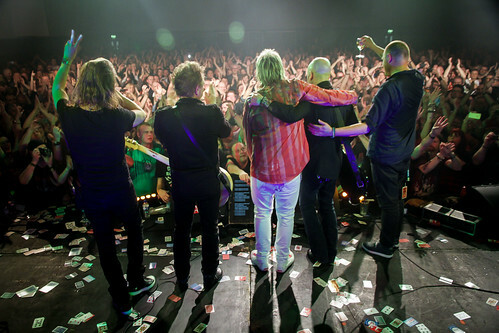 This time in 2016, Mike Peters was able to deliver the power of the band alone, utilising the same technologies and musicianship that is at the heart of modern groundbreaking performers like Ed Sheeran and more recently, Jack Garret. 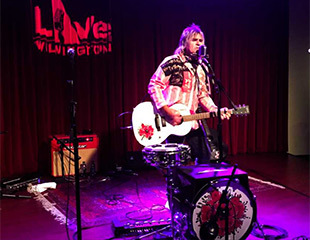 Of course, Mike Peters isn’t doing it all alone, every word of the songs are sung at high volume by the vast crowd that is jammed inside the venue. During moments in such songs as Blaze Of Glory, Walk Forvever By My Side and other standards from his extensive songbook, it’s clear where Mike get his inspiration…. his audience… and the life they have lived together as part of one generation. Here we have an artist and audience of one, one family, united at The Gathering. The fans are as much a part of this event as Mike and The Alarm, there are people from Finland, Germany, Switzerland, Holland, Australia, Canada, the Far East and the United States. All descending upon North Wales to celebrate the music, life and times of one man and his band. 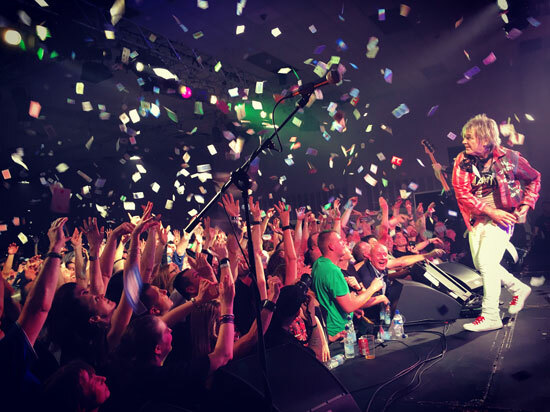 Despite his struggle with leukaemia, Mike Peters (56), looks fit, sharp and is able to perform at full throttle and in powerful voice for over 5 hours across two nights, but what people who only see Mike and The Alarm on tour don’t see is, the detail and dedication from the team Peters surrounds himself with who all help to make The Gathering the unique event it truly is. Mike’s entire family and friends are at the centre of things with Jules Peters (his wife), orchestrating the event on every level with brother Steve overseeing stage production. There are people who were involved in the very earliest of Alarm days enforcing the one to one connection of the weekend, people who I suspect had more to play in the history of the band than photos of just four lads who shook the world can attest to. There is Gareth ‘Gaz Top’ Jones who shared a London flat with Mike Peters back in 1981 and helped pack all 1000 of the original Unsafe Building singles. There is Richard Jones who runs the Mastermind Quiz and, (as the first ever official fan of The Alarm – when they were called Seventeen), knows more about Mike Peters and The Alarm than I dare say Mike knows himself. Alongside Richard, is Davey Garnett-Hughes who in 1986, flew to LA for the Spirit Of ’86 Concert at UCLA (celebrating it’s 30th Anniversary in 2016), and found himself being interviewed by MTV. Longstanding fans like Lily Elsayed from New Jersey, USA (who runs The Official Alarm Facebook page), celebrated her 50th Birthday and even had first generation Alarm guitarist Dave Sharp perform at her Off-Gathering party. There was a video premiere of new music from Mike Peters one time writing partner Eddie Macdonald who has formed a new band called Small Town Glory. It was refreshing to see all aspects of Alarm history acknowledged and celebrated in an open forum. In fact, the overriding feeling from the Saturday afternoon convention was that this event is very much about being in the present as reiterated by Mike Peters himself during his one hour Q&A and masterclass session where fans of a musical persuasion joined in for an ensemble performance of ‘Spirit Of ’76’. For some of the people on stage you could see that dreams were indeed coming true. Later that evening, as the countdown clock ran down from 10-0, Mike Peters took to the stage and declared ‘All great rock and roll starts with One Guitar’, the stage curtains fell and Mike Peters & The Alarm were in full flight for a 2:45 hour set of serious rock and roll. The temperature was so hot that steel could have been forged. How the band kept the tempo and intensity up I’ll never know, but the pressure was released slightly when Mike appeared on the centre stage with keyboard player Mark Taylor (the two longest standing members in Alarm history), performing with just voice and piano. Mike spoke with grace about his hero David Bowie and the affect of his recent passing from cancer, dedicating The Rock and Roll to him, it was poignant moment in itself that was made even more so when after a flourish of the final chords of Life On Mars from Taylor, Mike Peters began the opening lines of Starman and pictures of Bowie himself appeared on a huge projection screen above. Tears fell and emotions came flooding out as the rest of the band joined in from the MainStage. Alarm guitarist James Stevenson (who has been playing with Bowie producer Tony Visconti in Holy Holy), took over and delivered an emotive solo that honoured both Bowie and Ronson before the band came together as one on the main stage and took the Gathering to a closing finale that was punctuated with a million playing cards falling through the sky during closer ‘Where Were You Hiding When The Storm Broke?’. After the show, there was no Elvis has left the building, Mike Peters was once again among the throng posing for photos and signing pictures as the audience danced in the Love Hope Strength lounge high on life and rock and roll. Sunday morning rolled in and there was Mike Peters with his ever faithful Jules by his side, launching Snowdon Rocks for June 18th 2016 and delivering touching and open speeches about the state of his health (very good), and the forthcoming ‘351120; appeal which has already raised over £176,000 pounds to help other cancer sufferers and families in troubled times. It is this act of selfless good will that really embodies the qualities that have made all the music we have heard this weekend so relevant. It is timeless and of the moment, for and of the people but even after all of this, there was still enough energy in the Peters’ petrol tank to stay stood on his feet for another three hours posing for photos and signing records and CD’s for every single person who wanted a moment and each and every individual greeted with a smile and a mark of respect. This was a pivotal Gathering. 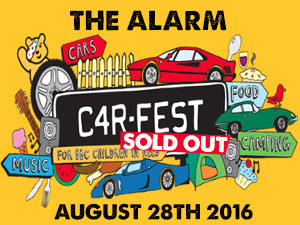 Historic even, certainly in the annals of Alarm history, but as everyone filed out past me all I heard was talk of the new songs, the new songs. The Gathering 25th Anniversary will be held on February 3,4 & 5th 2017. Miss it if you dare…….